Pumpkin spice, vanilla, maple pecan, almond milk… Lattes are taking over the word! I personally love lattes, especially in the winter! A nice warm, velvety smooth cup of deliciousness to warm your hands and your soul on a cool, brisk morning. But what exactly is a latte? In short, a latte is a specialty coffee drink made with milk and espresso as opposed to drip coffee. Espresso is made from finely ground coffee beans, brewed quickly using steam pressure. This method produces an ultra-thick, highly concentrated and highly caffeinated, coffee liquid. You may have heard of some of the latte’s siblings; different variations on this coffee classic – The Flat White, Cappuccino, Café Latte, etc. What is the difference between all of these espresso based, milk coffees? Caffe Latte: Otherwise known as a latte, simply put, is steamed milk and espresso. Cappuccino: Equal parts steamed milk and foam. Because there is more foam and less milk than a latte, you can taste the espresso more and it has a stronger, bitter taste. Macchiato: Contains no steamed milk at all, only a topping of frothy milk foam. Originating in Western Europe, the Latte has since been modified into a multitude of different variations. The word “Latte” stems from the Italian expression, “Caffe Latte” translating to “Milk Coffee”. You can’t go out for a latte every day, sometimes you just want to take matters into your own hands. But the problem is, you don’t have an espresso machine! Don’t worry…I was once in your shoes, and I solved my problem with a little innovation. You see, if you understand the basic concepts of the latte, you can construct your very own, very tasty version at home without any of the fancy equipment. An Aero press – A tool used to brew coffee very quickly by steeping it for 10 – 15 seconds and then extracting it through a filter using suction from a plunger. A Moka pot – A stovetop or electric coffeemaker that brews coffee through pressurized steam from the boiling of water. The French press – A true classic for any coffee lover, and yes, it can be used for espresso. Just use around twice as many coffee grinds as you would for regular coffee and don’t mix the grinds around. Instead let them steep, then push the plunger down halfway, back up and then all the way down; creating air pressure. After this immediately pour out your highly concentrated coffee / espresso into your serving glass / mug / cup. **The key to making good espresso is finely ground beans. Make sure to grind your beans on the lowest setting possible. Transfer the milk you want to use for your drink (2% whole-fat milk preferably, but any sort will do) into a mason or jam jar and shake. Shake for a good 60 seconds or so, until a frothy foam starts to form. Once the milk is nice and foamy, microwave it for 20 – 30 seconds. (I learned this trick as a kid, making steamed milk with my mom in the wintertime). That’s it! You can spoon off some foam from top of the milk to make cappuccinos, or mix it all up and create your own signature latte. Get creative it doesn’t have to be perfect! If you are privy to a professional espresso maker – I’m jealous – or have an automatic espresso machine at home, things get a whole lot easier! Add grinds and tamp your coffee: Tamping is the act of compressing your coffee grinds evenly to maximize coffee extraction. You don’t want air in between the grinds because the water could travel through too quickly, giving you watery espresso. Prepare your espresso vessel: Use the cup / glass / mug you intend to serve your espresso in, to capture the espresso. No transferring! Swirl milk in pitcher: This helps smooth out the frothy milk. Do this until it becomes a nice micro-foam. Then tap the pitcher on the counter to release any air bubbles that will take away from the smooth, velvety texture. Pour your milk from a good height: And then lower the pour as your fill. When complete, make sure a little bit of milk foam sits atop the latte by finishing your pour from a low height (almost touching). Voila! The perfect latte: There is a fair amount of craftsmanship that goes into that velvety, smooth delicious beverage. Remember, this is an art form so keep at it and you’ll see bountiful results. Contrary to popular belief, there is no specific coffee bean for brewing espresso. It’s all about the grind! Virtually any type of coffee bean can be made into espresso. As described earlier, you want to grind your beans finely and consistently. It is very important that the grinds are the same size so the water can flow through with the right amount of pressure. If there are any inconsistencies in the grinds, this could cause the water to flow through too easily; leaving you with watery, un-extracted flavour, or the water could get stuck and not flow through at all. Invest in a good coffee grinder. This is key! Not cleaning the espresso machine: Although this may seem obvious, an espresso machine needs a lot of love, and it’s always easier to clean when it’s still hot. Do it right away! Tamping too hard or too soft: A smooth, even surface is essential in the brewing process. Tamp first with a little pressure, wait for a second, and then tamp again with around 8 pounds of force. Not paying attention to the espresso pour: Just like any good chef or artist, make sure you are paying attention to your craft. Check the espresso coming out for consistency and colour. Not tasting enough: This is all part of the process towards perfection. Trial and error, is your best friend and you won’t know how you’re doing until you try your espresso. Grinding too much coffee: Grind what you know your going to use and don’t try to save time by grinding a whole bunch of coffee at once. It will go stale if not used, and god forbit the grind consistency is off! Not emptying out the filter holder immediately: Dump out your puck of coffee grinds as soon as you are done with it, run some water through it to rinse it thoroughly. Leaving used coffee grinds in your filter holder, can promote oil, grime buildup and make future coffee taste bad. Remember that making coffee is an art, and it takes time. Take the knowledge you’ve learned here today and experiment. This coffee has many attractive qualities such as being organic, GMO-free and made with 100% Arabica beans. The bean type is necessary to note because ‘Subtle Earth’ boasts the low acidity of this particular coffee. Especially in the US, arabica are the beans of choice for great coffee. They usually produce a sweeter, softer taste but are more acidic. If you have ever experienced acid-reflux or heartburn due to too much coffee, this is a great option for you. So, the next time you make a smooth, creamy latte at home, try these 100% Arabica beans with chocolate and caramel flavour notes and no heartburn! Also made by the “Colombian Supremo” brand, this 2lb package of pre-ground coffee is made without the use of GMO’s and is a low-acidic option as well. I know what you’re thinking: “Boo! Pre-ground coffee!”, and although freshly ground coffee is always best for flavour and aroma, we sometimes have to consider convenience as well. Especially if you are taking the time to create a latte yourself, you may not always have time to grind your coffee beans from scratch every day. This coffee comes pre-ground as a medium-coarse grind. You can always give it a little extra grinding to make it the perfect consistency for brewing espresso – this coffee is not one to be used in a professional café or restaurant anyways. It is a good at-home coffee, with a mild, cocoa toned taste that blends well with milk and creamy drinks. Here we go, now we’re talking! ‘Kenya AA’ coffee is on this list for the sheer status and flavour profile of the bean. This is a great choice for any true coffee connoisseur or anyone that loves dense, full-bodied coffee beans that are rich in flavour. Kenyan coffee is some of the consensus best in the industry. And beans graded ‘AA’ means that they are among the best possible quality. Treat these beans with the respect they deserve, grind them finely with a great grinder and brew them to perfection to create a masterpiece of latte art that will truly wow your friends, family and maybe even yourself! ‘Community’ is all about… well community. And the company brings people together by offering almost every flavour, roast-type and coffee option available. The premise here is to have an option for everyone, and that is why it is no surprise that they have a ‘Half-Caff’ option; consisting of half the caffeine as a conventional coffee. If you love coffee – and are like me – you consider it a daily routine and find it hard to take a day off. The only reason why I try – emphasis on try – to take a day off of coffee every now and again is because I love it so much I end up drinking too much, working too hard and not getting enough rest. So, for my days off, this is a great option for being able to enjoy a great latte or enjoy a robust cup of liquid pleasure while still getting a good night’s sleep – It’s the best of both worlds! 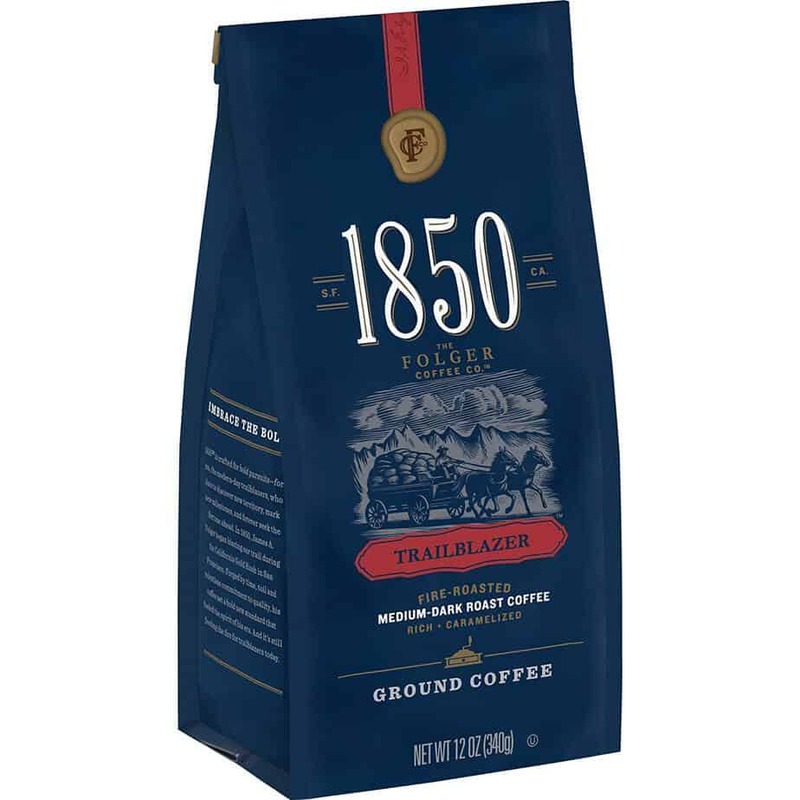 I’m a sucker for packaging, and this antique, traditionally themed ‘1850 Trailblazer’ coffee, immediately peaked my interest. I love the nineteenth-century style of the packaging – it just screams craftsmanship and quality. This pre-ground package is priced on the higher end when it comes to coffee of its quantity. It looks as if it belongs in a smoky, scotch room, surrounded by leather bound books – but your kitchen counter will do. You’ll definitely want to show this coffee off and is definitely a conversation starter. With roasted nut and caramelized flavor notes it pairs well with a smooth creamy, milk-based drink such as a latte, cappuccino or macchiato. Besides offering up to fifty-percent more caffeine than conventional roasts, you also get a powerful coffee taste. If you love the taste of coffee this is important especially when making lattes or specialty coffee drinks. The milk and other ingredients can often overpower the taste of your coffee. Personally, about twice a week, I will leave a coffee shop wondering if they even put any espresso in my latte. The taste can often get lost in the mixture of other flavour profiles. If you are investing in good quality coffee to make at home, you want to be able to taste it; it’s a pivotal part of the coffee drinking experience. And this is something you definitely get with this brand. So, if you love coffee; the taste, the boost of energy and mental focus you get from drinking it, then you’ll love this coffee! Espresso is what separates a delicious, voluptuous latte a from a plain coffee with steamed milk in it. Its medium intensity roast is compiled of beans from Africa, Central and South America and prepard in Italy – the home of espresso. This coffee by ‘Lavazza’ is best used with an espresso maker or moka pot but can be used for drip or pour over coffee as well – not the other way around! Great, Italian-made whole bean espresso, in a large 2.2lb bag. When it comes to crafting a latte, you couldn’t ask for anything more. Because Peet’s coffee is awesome! It’s that simple. Peet’s coffee is known for using only the best beans and following the best practices, and steps in order to create the best coffee. They just do everything right. Dating back to the 1960’s, Peet’s has perfected the brewing process and they continue to evolve. Any Peet’s café is a personal favourite hangout spot of mine, and with over 200 locations in the US, I can enjoy a local Peet’s latte – and most likely a pastry – wherever I am. If you want great coffee, start with great coffee beans. Choose between a multitude of different blends and enjoy a bold, intense and flavourful coffee at home, on-the-go and prepared however you see fit! ‘Eight O’clock’ coffee is another example of a great coffee developed over time. They roast 100% Arabica beans in the US (Maryland) and have been developing their signature brew ‘The Original’ for 150 years. This Colombian coffee has a unique taste, that has made it quite popular over the years. This medium-roast will fare well as a drip coffee, pour-over or you can grind it down finely and use it in espresso drinks – such as… you guessed it, a latte! You won’t know until you try it and this unique tasting coffee may just become your new favourite! ‘Mayorga Organics’ was built on the premise of making fair-trade, organic coffee without the use of chemicals such as GMO’s all while creating jobs for Latin-American farmers. Developed from the memory of a type of coffee the owner – Martin Mayorga – used to observe Cuban cigar makers drink, and brought to life 20-years ago. A thick, syrupy coffee with a distinctive, sweet taste. This environmentally and socially responsible coffee is great for espresso drinks and specialty coffees because of its unique texture and taste. Thick and syrupy is perfect when combined with milk and it’s sharp, sweets notes prevent it from being overpowered by other flavours. This kocher, 2lb, whole-bean package ticks just about any box you may have when it comes to coffee requirements, plus it is low in acidity.